Students performing in the Dolphin Show explore Bosnia and Herzegovina. The group was invited to perform as part of the U.S. Embassy’s cultural diplomacy program with Bosnia and Herzegovina. A modified cast and crew of this year’s Dolphin Show, “Little Shop of Horrors,” performed in four cities in Bosnia and Herzegovina over Spring Break. Elizabeth Blumenthal (Communication ’92), organizer of the 50th annual Dolphin Show, is now an assistant cultural affairs officer in Bosnia and Herzegovina. In December, Blumenthal reached out to Dolphin Show organizers and asked if they would be willing to perform American musical theater in the country. 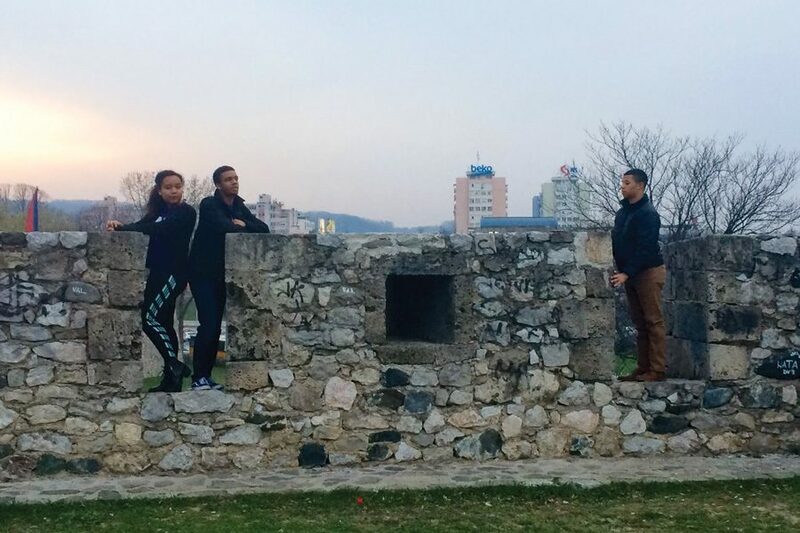 The group toured and performed in the cities of Banja Luka, Doboj, Mostar and Sarajevo over eight and a half days. The Daily spoke with Maggie Monahan, the director, and Janie Dickerson, the co-producer, about their experiences abroad. The Daily: How did the audience react to your shows? Monahan: They really were not as accustomed to the norms of the genre … People over and over again were saying, “You’re singing but you’re also acting, and then there’s a dance.” For them it’s much more normal for those things to be segregated. And it was surprising and exciting, I think, for them to see so many different modes of storytelling integrated. Dickerson: That was the best part. They didn’t know what to do with themselves. They didn’t know when to clap, they didn’t know what intermission was, they just kind of sat there for 15 minutes. After each performance we had talk-backs with the audience, and that’s when it became really clear the impacts that our performance had on them. There was one woman who (said) … “I have to stand to show my great respect for you” and we had people who said it was an honor to watch the show … It was amazing. The Daily: What were some of the logistical challenges you faced with performing this show abroad? Dickerson: We had to scale back the show a whole lot … Most of the cast was entirely different. We had four people from the original cast, only two people played the same roles. The other two had to learn brand new parts and the rest of the cast had to learn the show in two and a half weeks. Having different actors really made all the difference in altering the vision of the show in really awesome ways. Monahan: It was definitely a stripped down production … I don’t think that it was compromised artistically at all, but there were definitely compromises that we had to make to the production, even if we didn’t sacrifice it artistically. The Daily: What did bringing the Dolphin Show to Bosnia and Herzegovina mean to you? Monahan: For our performances in Doboj and Banja Luka, it was particularly significant for advancing the interest of the embassy there, because those are parts of the country that still hold onto a lot of hostility towards the United States from our involvement in the war. So for there to be so many young people in those communities who were excited about seeing the show, it was some of the first meaningful contact that they’ve had with Americans in their lives. Dickerson: I just can’t stress enough the power of Northwestern alumni and … The Dolphin Show and student theater. One of the main reasons for the trip was to show the students in Sarajevo how young people can be proactive and be entrepreneurial and produce their own work. They don’t need to sit around waiting for someone else to do it for them. They were really moved by the student-produced element of The Dolphin Show and it was really important to them and it’s also really important to us.